This brief review of the creation of these two espresso machines will surely ease the choice between the Nespresso Creatista and Creatista Plus. 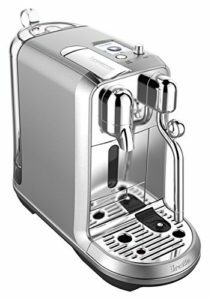 It is important to say that these espresso machines arise as a product of the cooperation of two exceptional companies, Nestle Nespresso and Breville. Both companies have directed their skills and experience in the production of top quality coffee machines that, with minimal effort, give you exactly what you need, a fantastic coffee to start a day with. First of all, we will write a little bit about these companies in order to understand what personal seals they gave to these espresso makers. The Nespresso is a branch of Nestle company, that has focused its production primarily on the creation of high-quality coffee machines. Naturally, Nespresso coffee machines are known not only for their quality and superior design but also for the capsule system that makes the preparation of coffee look like a child’s play. The capsules produced in different flavors give a great choice to the users of this espresso machine, but also the certainty that the prepared coffee will always be fresh and full of flavors. In 1986, this company began with innovations on the coffee machines they produced at that time, focusing primarily on making a premium espresso machine that does not make espresso in an original way, but again guarantees the top flavors. For people who want a quick way to get a great cup of coffee without getting stuck in too much work, this is a right choice. During the 80s Breville company ruled the scene as a company that produces various kitchen appliances. Creating many original appliances at that time, Breville has brought many innovative products to many households. 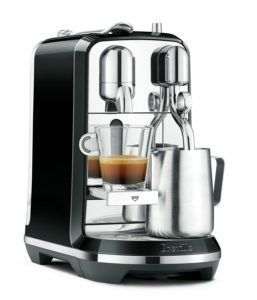 When it became a popular to have your own coffee machine among all other kitchen appliances, Breville started with a production of a coffee machine that would have all those little options that allow you to drink a real Italian espresso in your own home. They paid a special attention on the production of a good steam wand to get the best milk froth needed for good coffee. When they made Nespresso Creatista and Creatista Plus, these two companies created a real masterpiece. Today, these two coffee machines are at the very top because of the all good features they have. From a premium capsules system that at any moment gives you superior espresso, to the steam wand which gives you the ability to froth milk like Italian barista. We certainly intend to give you a review about these two espresso machines because you are surely wondering what are the significant differences between them and are there any differences between them at all. The word „ Plus“ in the name of Creatista Plus says that this device has some + options. These two machines have almost same features only, some of them are a little bit enhanced when it comes to Creatista Plus. Of course, all the improvements are calculated in the price of Creatista Plus. In the reviews, we will specifically highlight what are the differences and what is improved in the creation of Creatista Plus. Enjoy! After this table, it is important to say that Nespresso Creatista and Nespresso Creatista Plus machines have a lot of similarities. Their appearance is different in the type of their material, the Creatista Plus is made entirely of stainless steel, and the Nespresso Creatista is made in a combination of materials, the front panel is made of stainless steel and the sides are made of plastic in black color. At the top of the coffee machine, there is a door for OriginalLine Nespresso capsules. Nespresso Creatista and Creatista Plus offer the possibility to use various flavors of the capsules, so you can enjoy the tastes that suit you best. When using Creatista and Creatista Plus you need to use the first generation of Nespresso capsules. AT the top of the machine there is an LCD display as well as two control buttons that allow you to completely customise the drink you want and adjust it to your desires. With these buttons, you can determine which drink you want, temperature and texture of milk as well as the coffee strength. On the right side of the front panel of the machine, there is a cup trey. On this side, there is also a plate for small cups that can be pull-out like a drawer, and a drawer for the used capsules. On the left side of the front panel, there is a self-clean steam wand made of stainless steel. With this coffee machine, you also get a stainless steel jug which is located below the steam wand and which stands on the temperature sensor that detects the temperature of the milk. The drip tray is easy to remove so it can be cleaned easily. Both coffee machines offer numerous options that will surely allow you to make a drink that suits your desires. The differences between Creatista vs Creatista Plus are not too extreme, so the price difference between these two is not big. Some might say these are one of the expensive coffee machines, but they are also the machines that allow you to drink „barista-like“ made beverages in your own home by a simple press of the button. They are definitely worthy to become a New Year gift in you house.